Kanchanjunga world's third tallest mountain stands on the border of Nepal & India and south of Tibetan Autonomous. A trekking to Kanchanjunga is real wilderness adventure, fascination of Mountains, Local villages and living in harmony of different ethnical group in the low land Rai, Limbu and Chhetri and upper part dominated by Sherpa Peoples who have migrated from Tibet long ago. Various types of The flora, fauna, herbs & scrubs are the other feature of the trip. Government of Nepal opened Kanchanjung Region to trekkers in 1988. Though people had trekked in the area in connection with mountaineering. 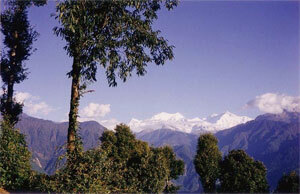 Kanchanjunga is situated on the border of Nepal and India, state of Sikkim. To entire circuit of mountain politically is not possible. The next best alternative is to visit both Base Camp North Pangpema (5100m.) and south Yalung (4800m.) from Nepal. You require being well equipped for a high pass crossing and having a minimum of four week to spare. It is not so easy to cross pass either Lapsang La or Mirgin La. Bad weather and snow are often to blame, but more often it is sim;lu lack of time to get startint point of Kanchanjung. Either you have to fly Suketar or drive from Kathmandu to Hille Basantapur (552kms. ), other option you can drive from Kahtmandu to Taplayjung via Ilam, but it is long journey. On the route, elsewhere, lodges are not. There is some in the manor village at the lowland that are primitive styled. You can trek either to the North or South Kanchnjunga Base Camp but takes luck, determination and allot of time to visit both side of the peak. Both side of upper land is particularly remote. Visit of this trek is tremendously wilderness. If you are having short time, you can fly to Suketar from Biratnagar and fly from Suketar. Day 01: Arrival in Kathmandu. Transfer to the hotel. Welcome Dinner in the evening. Day 11: Khambachen. Acclimatization day. Day 22: Biratnagar- Katmandu by plane. Day 23: Rest day in Kathmandu. Farewell diner in the evening. Day 24: Transfer to airport for airport departure.